Jean Beliveau was the most regal of kings. He was also the most important Montreal Canadien in the life of the franchise. Not Maurice Richard. Not Guy Lafleur. Jean Beliveau. When Beliveau ascended to the Habs lineup for good in 1953, the Toronto Maple Leafs reigned as hockey's dominant team with nine Stanley Cups to the Canadiens' seven. Seventeen more championships would follow in Beliveau's lifetime. He would win ten as a player including five as captain. He would gain seven more as a club official. No one else in NHL history can approach that level of success. Beliveau, of course, brought the polish to a franchise invigorated by Maurice Richard's passion. His countenance on and off the ice, his abundant and obvious decency, his prodigious talent and work ethic infused the organization and positioned the Canadiens as the NHL's gold standard for excellence over four decades. 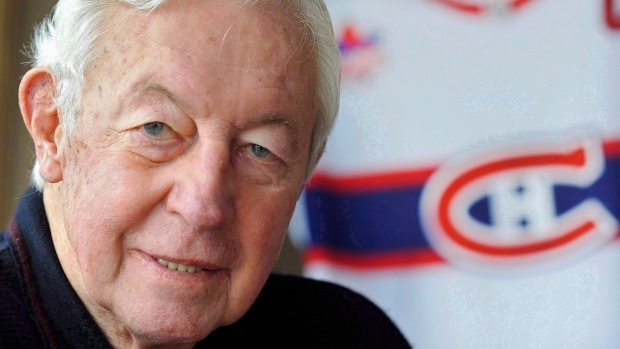 At six-foot-three, Beliveau had every gift that could be bestowed on a hockey player. "He was one of a kind, a classic," Hall of Famer Ranger Rod Gilbert once observed. "Jean Beliveau was probably the best player ever in the NHL. He was a typical centreman with lanky strides and vision to both sides. You talk about Wayne Gretzky, Mario Lemieux, Beliveau was as good as them in our time." The best stickhandler of his generation, Beliveau leveraged a small man's skills: agility, imagination, into a package that had not existed before his widely-heralded debut with the Canadiens. He was a giant, Le Gros Bill, a player whose elegance outstripped even his own top-drawer skills. Consider this for a moment. Like Joe DiMaggio, who won nine World Series and is lionized for the way he carried himself, the unquantifiable elements of how Beliveau looked – graceful, confident - dwarfed one of the greatest records in hockey history. The New York Yankees are the dominant personality in baseball because Babe Ruth's colorful, reckless genius was followed by DiMaggio's seemingly effortless grace. Ruth was a simple man, often a vulgar primitive whose greatness shaped the game into a business. DiMaggio, courted as assiduously by the Yankees as Beliveau was pursued by the Canadiens, gave the Yankees mystique and existed as a counterpoint to the raw emotion delivered by Ruth. The Canadians thrived on a similar dynamic. Richard's primal need to score was instantly recognizable in Montreal. Roch Carrier's famous tale, The Hockey Sweater, speaks to the desire of Quebec schoolboy to be Maurice Richard. That said, Beliveau became a strikingly attractive role model for another generation of Quebecers who came to see economic success and sophistication as an important element of self-rule. A canny businessman, Beliveau is as said to have earned as much money as Richard while starring for the Quebec Senior Hockey League's Quebec Aces. It took a masterstroke from Habs' General Manager Frank Selke – he bought the entire league to secure Beliveau - to cut into the young star's bargaining power. Beliveau's personal integrity was inviolate. He was influential in supporting the formation of the NHL's players' union in 1967. When the fledgling Quebec Nordiques offered the 39-year-old Beliveau $1 million, (more than he earned in all his seasons with Montreal) for one season on the ice and three more as an executive, he turned them down. Beliveau was coming off a 76-point, 70-game NHL season. That he could no longer compete to his own astronomical standards trumped how easily he would have negotiated the watered-down game in the first days of the WHA. Prime Minister Jean Chretien offered Beliveau the coveted title of Governor General in 1994. Beliveau's family was in the midst of a crisis. He turned the job offer down. "I would have been deserting my family," he said. Beliveau withstood the churn of the captaincy in Montreal and he calmly handled the attendant political/media elements. In 1971 when Henri Richard blasted his coach Al MacNeil in the Stanley Cup final, Beliveau squeezed Richard's arm as he complained to a reporter about MacNeil. The story created a linguistic firestorm but it took merely a touch from Beliveau and Richard did not add another drop of gas through the series. That summer when Beliveau officially retired, the same reporters accorded him a standing ovation. Beliveau was born in Trois-Rivieres and raised in nearby Victoriaville. Life was not easy. Jean, the oldest child, was ten years old when his sister Helene was hit by a car and killed in front of the family home. His father, Arthur, worked for the power company and his mother, Laurette, toiled as a homemaker. He did not play organized hockey until he was 12 but soon scouts were flocking to Victoriaville to see the strapping prospect. One Canadiens' operative approached Beliveau on his way home from a baseball game, took him to lunch and laid out $200 in bills to induce him to sign. The boy did not have so much as a dime in his pocket but Arthur mistrusted the standard C form that indentured a player to an organization indefinitely and Beliveau eventually landed in Quebec City. Jean Beliveau brought Victoriaville and his working-class roots with him wherever he went. "Nothing comes easily in life," Arthur Beliveau often told his son. "Discipline and hard work will make you who you are." "I think I've worked hard all my life and I have always tried to be there whenever the team, the company or my family needed me," Beliveau said. His lifelong maxim was simple enough: give more. "When I accept something I've always said 'do it right. Take the time.' Too often you go to an event, you see athletes or personalities who look at their watch and wonder when it will be over. Maybe one of my secrets is to give the organization or the person more than they were expecting." Those qualities were what his teammates had in mind when they voted him captain in 1961. The move devastated Boom Boom Geoffrion who was coming off a 50-goal season. After a week mulling over his options, Beliveau offered to give the "C" to Geoffrion but Selke overruled him. "I can't tell the players we are going to give it to Geoffrion and not you," Selke said. "If Geoffrion isn't happy that's his problem." Always a gentlemanly player, Beliveau tired of being roughhoused by his third season. "Hitting people wasn't his nature," said his longtime teammate Bert Olmstead. "But I think he realized it was time to stand up and be counted." Beliveau initiated more contact and his penalty minutes surged from 58 the season before to 143 in 1955-56. He scored 47 goals, piled up 88 points and won the first of two Hart Trophies and the Art Ross Trophy. Beliveau had transformed himself into a power forward decades before the term had been coined. He won the brand new Conn Smythe Trophy at 33 years old. He was a first team all-star six times and a four-time runner up for the Hart. Beliveau would finish among the league's top 10 scorers in 12 of his 15 full seasons. There were, of course, always expectations for more. Beliveau's skill level was so jaw-dropping, a two-goal night would often be characterized as an evening where he should have had three. "It's tougher," said Frank Mahovlich who would know something about mile-high expectations. "You're bigger and people are expecting more from you. It wasn't easy for Jean. I played with him and I know, he worked hard in practice and in preparing himself." Beliveau retired in 1971 as the team's all-time leader in playoff points. His 507 goals were second only to Richard. Had Beliveau started with the Canadiens at 20 instead of 22 he could have surpassed the Rocket's 544 goals. It would have changed nothing, of course. Beliveau was never about the points. His allure even transcended winning. Few of the obituaries will focus on the hallmark by which everyone else is measured: success. Instead they will speak of decency and dignity and grace, still more categories where Jean Beliveau had no equal and precious few peers. Mike Ulmer is the author of Canadiens Captains.